Breaking Glass Pictures has send us over information for the upcoming DVD release of "Southern Baptist Sissies". The film has played 28 film festivals, winning 15 awards including 9 audience awards. It stars Emerson Collins ("Sordid Lives: The Series"), Leslie Jordan ("Will and Grade," The Help), Matthew Scott Montgomery ("So Random"), Bobbie Eakes ("The Bold and the Beautiful"), and Willam Belli ("Nip/Tuck," American Wedding). No special features were announced. "Southern Baptist Sissies" hits stores on November 4th. 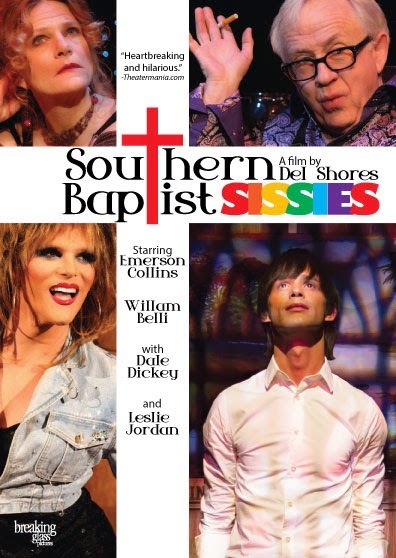 Breaking Glass Pictures will be bringing Del Shores' award-winning play Southern Baptist Sissies to DVD on November 4, 2014. The GLAAD award-winning play is the story of four gay boys growing up in the Southern Baptist church and how they deal with the conflict between religion and sexuality. Southern Baptist Sissies stars Emerson Collins ("Sordid Lives: The Series"), Leslie Jordan ("Will and Grade," The Help), Matthew Scott Montgomery ("So Random"), Bobbie Eakes ("The Bold and the Beautiful"), and Willam Belli ("Nip/Tuck," American Wedding). Southern Baptist Sissies explores the conflict between the caustic rhetoric of dogmatic religion and the fragile development of adolescent homosexuality while challenging hypocrisy, exposing damage and offering hope. The intimate experience of theatre on the film screen reveals the complicated emotions from all sides - the confused child, the struggling adolescent and the angry and damaged adult. Southern Baptist Sissies made its world premiere at Outfest in 2013 and went on to play at 28 film festivals, winning 15 awards including 9 audience awards. Theater Mania.com calls the film "Heartbreaking and hilarious."